North West Regional Black Members bring issues facing Black Members to the attention of our Regional Secretariat. Workplace issues such as unfair dismissal, discrimination and racism. We fight to create policy change within the union which will have an impact on and be reflective of our experience, both at work and within the union. We offer support and guidance to each other by sharing our experiences which assists us in our work supporting members. By attendance at regular funded committee meetings, we try to meet UNISON’s objectives in terms of Black Members. We discuss how we can take appropriate action to represent the issues which mean the most to the members we support. We get involved with community projects and events as well as local, regional and national campaigns. We meet three times a year, generally at the Regional Office at Arena Point, 1 Hunts Bank, Manchester, M3 1UN for a two hour meeting and the group is open to all UNISON Black Members in the North West region. Come and join us for our next meeting, which is the first for 2015. 19-20 July. Manchester Caribbean Carnival. Platt Fields Park. Event website. 21-22 June 2014. Manchester Mega Mela. 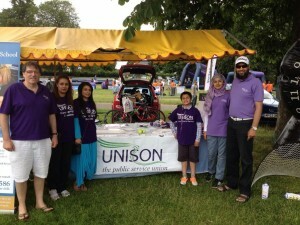 Raising awareness of UNISON at the Mela.